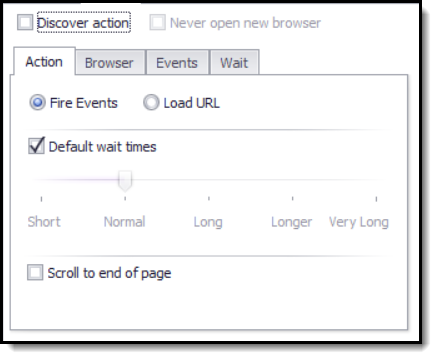 •Fire Events - The command fires events, such as a mouse click, on the selected web element. •Load URL - The command loads a new page into the web browser using a direct URL. •No Action - The command does not execute an action. This is only relevant for form fields which may execute an action when an input values is assigned, but often execute no action at all. An action command uses Wait Time values to determine how long it should wait for activities, such as how long it should wait for a new page to start loading. If you decrease the Wait Time values, the agent will run faster, but it may not work correctly if the website is slow. If the website is very slow you may need to increase the Wait Time values to make sure the agent works correctly. If the option Default wait times is checked, the command will use the same Wait Time values as the parent action command. Some web pages load additional content when you scroll the page - either downward or to the right. To extract all content from such pages, you need to include an action that scrolls down to the end of the page, so all content is available to the agent. When you set the option Scroll to end of page, you will be able to limit the number of times the command scrolls to the end of a page to load new content. This can be important, since some pages will continue loading new content for a single page until Content Grabber finally runs out of memory.